Low-cost solar cells appear to now be one step closer to becoming a commercial reality, based on the findings of new research from the Okinawa Institute of Science and Technology (OIST). The researchers at OIST have been working on the creation of solar cells based on organic materials that possess electrodes that are both flexible and transparent — potentially allowing for the fabrication of low-cost solar cells. This work has been detailed in a new paper, where electrodes made from various different materials are characterized in detail. Materials include: plastic, conductive material, and zinc oxide. The researchers have also devised new methods of cleaning the electrodes, in order to restore conductivity and function after periods of long-term storage. Traditional silicon-based solar cells are expensive to make because of the cost of the raw materials and stringent fabrication requirements. Silicon-based solar cells are also rigid and opaque, meaning their usage and placement are limited. Qi and colleagues work with flexible conductive materials that are also transparent. The fabrication of the “Flextrodes,” as these flexible transparent electrodes have been named, is more cost effective and potentially easier to fabricate using a method called roll-to-roll coating, due to their flexible nature. For example, the main component for fabricating Flextrodes is PET, the same inexpensive and readily available plastic that comprises disposable drink bottles. In addition, their use and placement is potentially much more diverse than the silicon cells. For example, they may even be placed on windows since the organic solar cells can be made partially transparent. Since these Flextrodes are a relatively new technology, basic surface science studies had not been conducted. In their recent paper, Qi and colleagues looked at their work function, surface conductivity and chemical states. They also observed that after an extended period of storage, Flextrodes had an insulating layer of contaminants on the surface that greatly reduced their efficiency and function. The researchers were able to show that two common cleaning methods, one using UV ozone treatment, the other using oxygen plasma treatment, were both effective in removing the contaminants and restoring function to the Flextrodes in a timely and cost-efficient way. The research demonstrated that these methods could easily be integrated into the solar cell fabrication process to regenerate ready-to-use Flextrodes. 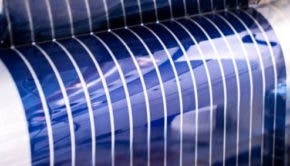 The researchers think that low-cost organic solar cells are the wave of the future, and that this work should help to drive the technology forward, explaining that one of the major advantages to the technology is that, “unlike conventional silicon-based solar cells, the organic materials available to make the cells are virtually limitless.” This allows for, potentially, far cheaper fabrication costs. The new findings were just published in the journal Organic Electronics.